December | 2012 | Leo Tunapika? You’ve woken up late and you need to take breakfast. So what to do? This will take less than five minutes to put together. I can guarantee that. Cereal – I used weetabix. This recipe can apply for cornflakes or muesli or whatever cereal you have on hand. In a cereal bowl, add in your cereal. Add in the sliced banana and strawberry. Finally add in the milk. Eat up, you are late for work. PS: I don’t add sugar to my bowl of cereal plus the fruits act as the sweetener. Quick and nutritious breakfast. Yum!!! I love cooking and venturing into the deep when trying out recipes but there are a few recipes that I even tremble at the thought of trying them. Some of you may wonder how one can get scared of cooking pilau, but trust me, it was a real fear. Fear, mainly because I don’t want to fail. Perfectionist much? Anyway, thanks to my dear friend Nixx and the many bridal showers I have attended, I can say I felt confident enough to make pilau this past Sunday. You may question the relation between pilau and bridal showers. Well, in the past two bridal showers we’ve held for our friends we decided to cook food instead of the usual bitings and on these occasions I got chance to see how to prepare pilau. Enough with my stories and onto the recipe. I didn’t have the store bought, already mixed pilau masala but since I had whole spices in my spice rack, I decided to make my own masala. Side Note: Masala – a combination of various spices. There are various ways of making the masala mixture but I chose the easiest. I’ll take time and write a detailed post on spices and making masala. I put all the spices in my little grinder. For the cardamon I removed the seeds from the pods first. Grind till you get an almost fine powder then add the black pepper and set aside. Heat the vegetable oil in a sufuria. Add the onions and the ginger. Let the onions brown, this will aid in giving the rich colour in pilau. Once browned, add the tomato paste and salt. 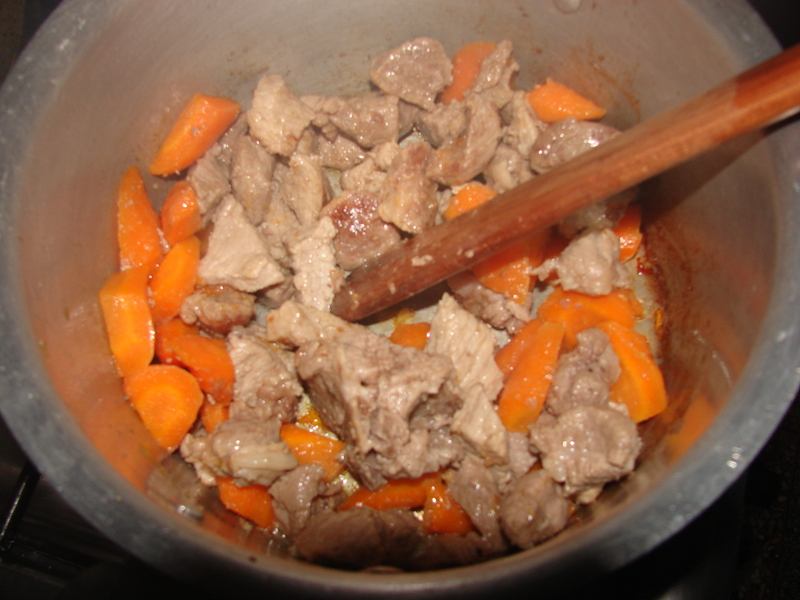 Add the meat and mix. Once the meat is cooked add the rice and the masala. Add in the hot water and slightly cover the sufuria. Let the rice simmer till almost all the water evarporates. Turn off the heat and cover the sufuria for about five minutes then serve. I was extremely proud of myself. Thank you Nixx. It’s safe to say, I will be making pilau more often. PS: Garlic is also used but I had ran out of garlic. 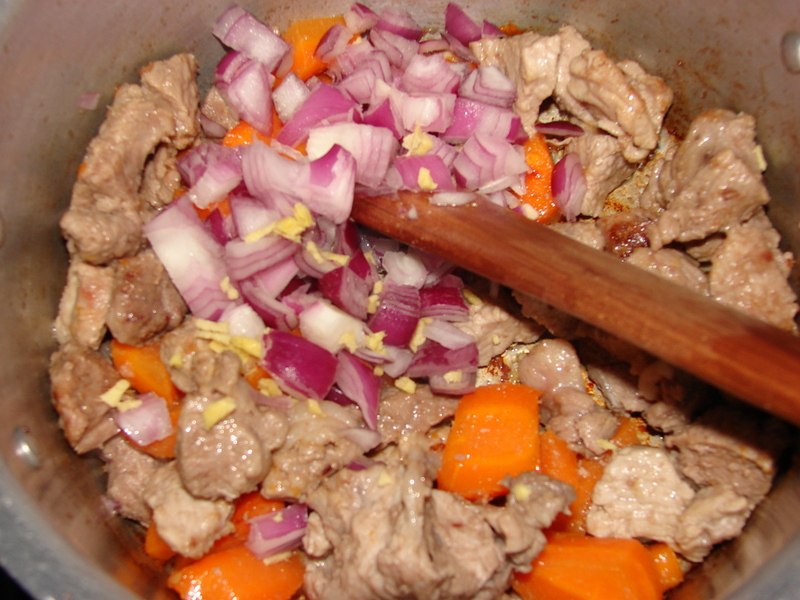 You can add 3 grated cloves into the onions. My dear mother calls me up to ask if I’d like some matoke (plantain/green bananas) and I’m like why not. She sends my brother to drop them off. Fast forward three days later, on that Thursday I manage to get home early and instead of just making the bananas in a stew I decide to make some crisps. This recipe is pretty easy and quick to do. You only need bananas, oil for frying them and salt to taste. Start by peeling and washing the bananas. Tip: Apply some vegetable oil on your hands before peeling the bananas to avoid the sap from sticking on your hands or you can wear a clear polythene bag as gloves and peel away. I cut the bananas into small horizontal slices, about a centimetre thick. In a pan, heat oil then add the matoke slices. Ensure when putting the matoke you lay them in a single layer to avoid them from sticking to each other. Do not be tempted to keep turning them. At this point, I heard a knock on the door, on opening it was my small brother Leon, he’d been sent by my other brother Sam to pick something from me. The first batch of the crisps were already cooked so I shared them with him while catching up. So, this lady forgot all about the other crisps in the pan and by the time I got back to the kitchen this is what I found. Imagine!!! Such disappointment. My dear friends when cooking these crisps please don’t leave the pan unattended lest you want burnt crisps. Taking of once bitten twice shy well that doesn’t apply to me since I successfully managed to burn the third bunch, unlucky much? For the fourth and final batch I stood watch and even reduced the heat just to be on the safe side. Luckily they didn’t burn. I saved them for hubby. Though few, they are pretty tasty. Now, I’ve purposed to personally buy matoke and make these crisps. Guacamole is an avocado based sauce. It originated with the Aztecs in Mexico. So, I bought some avocados a while back and one thing I know about avocados is that they tend to all ripen at the same time, so if you have many on hand it’s best you share with a neighbour lest you end up throwing some out. My hubby loves avocados and this love is what made me buy them. I like them too though not in smoothies/juices. I prefer eating them with food or in sandwiches but not in fruit salads, weird? I can’t seem to remember what I’d prepared for dinner that night but I also made some guacamole to go with the meal. The beautiful thing with this salad is that it can be done in so many ways as long as you have the avocado to begin with. It’s pretty easy to do. Cut and seed the avocado. In a bowl, roughly mash the avocado. To prevent the avocado from turning dark sprinkle the lemon juice. I have tried this tip and I can attest to its success. Next add in the onions and garlic. 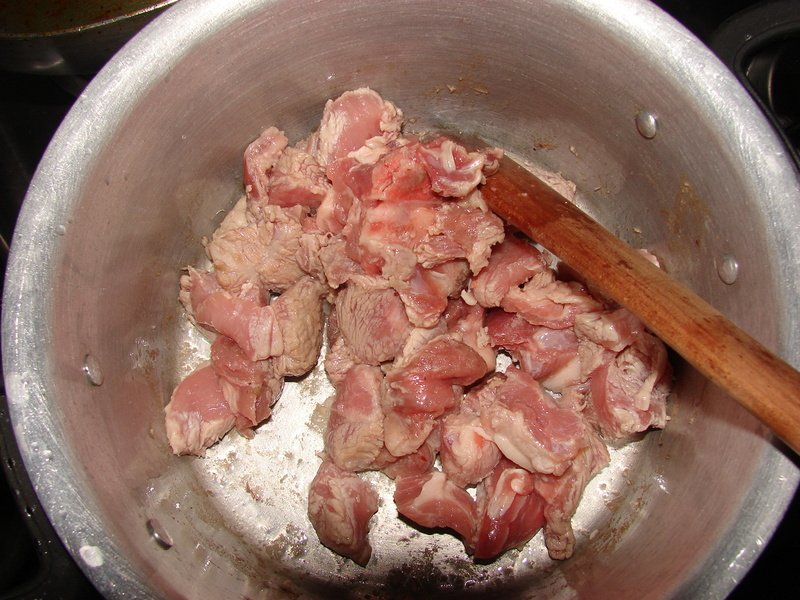 Add the chopped dhania, season with salt then mix all the ingredients together. Again you can tweak it to your taste. Hubby loved it, though he didn’t like the raw garlic taste so I guess next time no garlic for me. 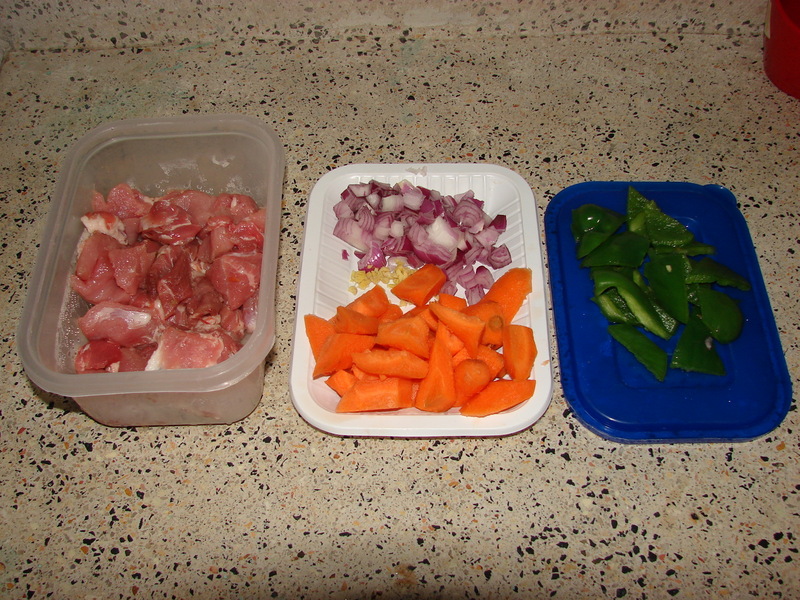 Some days back, I was feeling kinda lazy and I needed to prepare supper. We had some leftover ugali and veggies so I just need to cook some fish and dinner would be done. This recipe is pretty simple. You can choose to substitute with the herbs/spices you have on hand. I guess the mandatory ingredient is the fish fillet not forgetting the salt. Start by greasing your baking dish wish some butter or one tablespoon of vegetable oil. I used butter. Remember to pre heat your oven at 370ºF. Cut the fish fillets in big chunks, then salt it on all sides. Grate the zest of one lemon over the greased dish. Sprinkle about one tablespoon of dried parsley leaves. Place the fish chunks on the dish. Sprinkle the top with another tablespoon of the dried parsley, some lemon zest about a tablespoon. Finally I added some fresh sprigs of rosemary for flavour. Pop it in the oven, set the timer for 15 minutes. I turned the fish just once to enable the other side to cook. not the bottom side has turned white, signs that it has cooked. Bake it for 10 more minutes. Serve while hot, garnish with some lemon slices. Two Saturdays ago, As I was on my way home from town I decide to whatsapp my friend Brendah. I asked her to come over we bake banana muffins… well they ended up as cupcakes O-o. While still on the road, my friend Mercy texts to find out if I’m in the house. I tell her that I’ll be arriving in the next 30 minutes, so she says she’ll stop by. So just like that it turns into an evening full of great laughs. Mercy arrives first, finds me busy preparing for dinner. I had decided to try out a pork recipe I’d seen on Chef Raphael’s page. The recipe is pretty simple and by the looks of the photo that the chef had uploaded it also looked delicious. Have I mentioned that the lights were also acting up, going on and off after every 5 minutes? That’s Kenya Power for you. Heat the oil in a sufuria then add in the pork. Stir, then cover to let the pork cook. At this time Brendah had arrived. she found Mercy seated on a stool in the kitchen. Mercy isn’t much of a cooking girl but on the other hand Brendah loves to cook. What i love about these girls other than that they are my good friends is that they are full of life and they speak their minds. Brendah got straight into making the banana cupcakes batter while Mercy filled us with stories. Back to the pork. 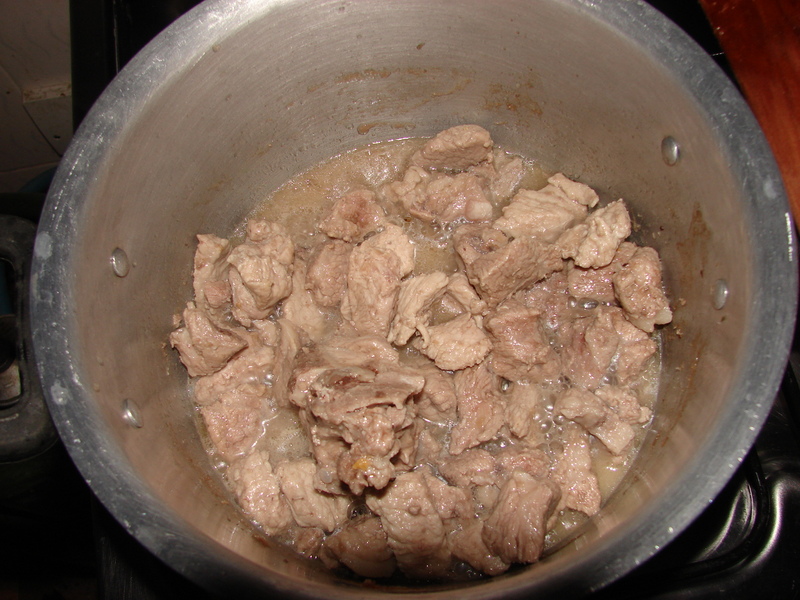 After cooking for about 15 minutes it will be filled with favourful pork juices. Let the carrots cook down until there’s no more liquid. Then add the onions and garlic. 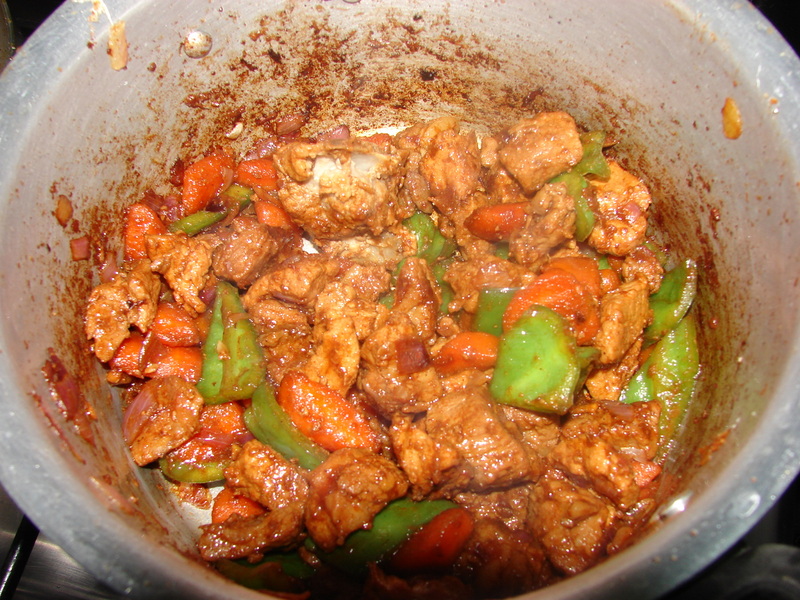 After the onions have cooked add the green pepper and sprinkle about a tablespoon of soy sauce. Stir, let it cook for 2 minutes or so. Serve as desired. I serve over steamed white rice. By the time the pork was done, Brendah has finished making the batter and we popped the cupcakes into the oven. I’ll link the recipe in the next post. Mercy is allergic to eggs so for her cakes/muffins are a no no. So whenever we go for weddings I like sitting next to her when they are serving cake so that she can give me her piece. What are friends for? Since she wasn’t going to eat the muffins, we decided to make smoothies. Spontaneity in the kitchen. The pork was delicious. I have cooked it once more since then.